A must for every fan of this very well known motor sport... you know the one! 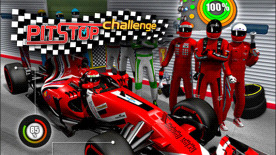 Pitstop Challenge is a sport game like no other. Your goal is to become the best pitstop crew on the motorsport circuit. You are responsible for selecting and managing a team of mechanics and sending them to 19 of the world's fastest races, each one having 10 fantastic cars needing a pit crew. With 24 car mechanics at your disposal, your job is to make them the best! Train them to become the fastest pit stop team in the world. To achieve the best score, make sure you assign the most suitable mechanic with appropriate skills to each task. So don't wait, start your high-speed adventure now!